We had our last workshop for Bukit Batok East Community Centre. 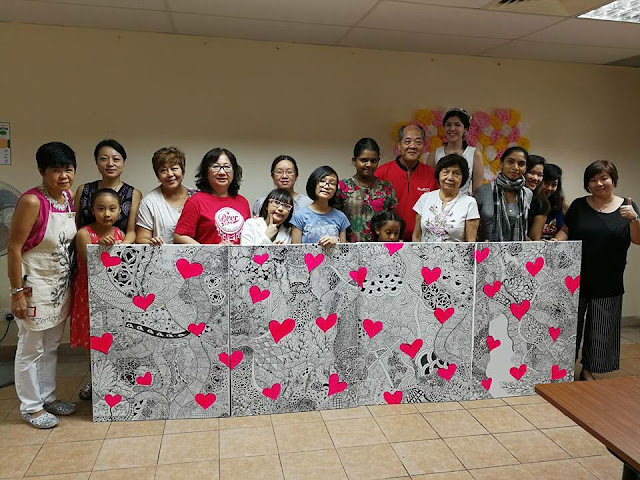 The idea is that over three workshops, residents from Bukit Batok East would come together to create a large 4m by 1m (13 feet by 3 feet) community art work to be displayed at an art fiesta happening in July. The event is called "heARTland" (how cute) and will be held near Toh Guan Park RC. I'm really tall cause' I'm standing on a chair. If you'd like to see close-ups of each of the canvases, you can do so on Everything Is Art's Facebook page right here. In other news; I'm part of an eight teacher team that will be teaching an online journal course. In my video, I will teaching you how to merge tangles together. Here's the final outcome that you'll get. On to weekly challenges... Joey's tangle for this week was "Yuma", so here's my tile for it. Finally, here's a personal project that I just completed. I made all the tiles entirely using Tombow markers (from the backgrounds, to the tangles, to the shading). If you're located in Singapore, you can buy Tombow markers from here. The comparison between your two yuma tiles is fascinating, Stephanie. Brilliant idea. Interesting to see the same tangle completed with different hands. I wonder sometimes why we have one hand that works so much better than the other. That's really fun the way those tiles join, and I love the colorful tiles you shared! Lovely work that you had your group do kudos!